After traveling the world and it’s seven seas and much contemplation, I decided to do my IDC and MSDTI at Sairee Cottage Diving. 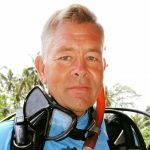 The PADI Course Director Marcel van den Berg is a natural teacher who is knowledgeable about diving and super passionate about the sustainability of the ocean and its’ surroundings. Together with Flavius and May, they trained us effectively in a fun way, which helped our group to become not only instructors but also friends. Afterwards working with great Instructors certifying students, truly shaped me into a motivated and great instructor. I have learned a lot from Gaz, Martin and Kaylie and I am taking very useful tips from them with me forever. Having my internship cut short due to unforeseen circumstances was a disappointment. If you want to become an instructor I would highly recommend Sairee Cottage Diving. Thank you Trevor, Bear, Barry, Gal, Marcel, Flavius and the rest of the team for an amazing life changing experience.